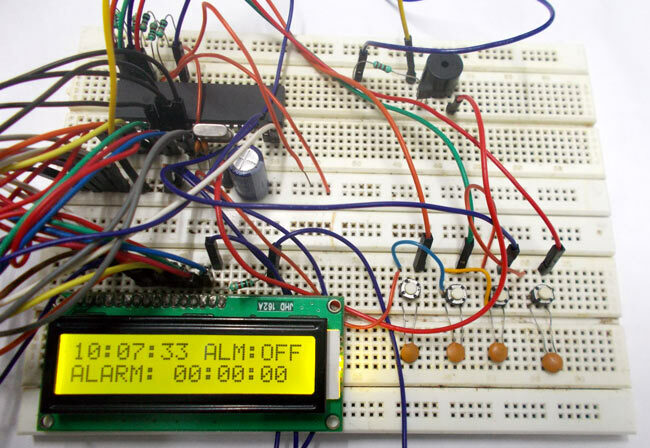 In this project we are going to design a simple Alarm clock using ATMEGA32 timers. ATmega32A microcontroller has a 16 bit timer, and we will be using that timer to count the seconds and develop a digital clock. All the digital clocks have a crystal inside of them which is the heart of clock. This crystal not only present in clock but present in all computing real time systems. This crystal generates clock pulses, which is needed for timing calculations. Although there are some other ways to get clock pulses but for accuracy and higher frequency most prefer crystal based clock. We are going to connect a crystal to ATMEGA32 for getting accurate clock. Hardware: ATmega32 microcontroller, 11.0592MHz crystal, 22pF Capacitor (2 pieces), Power supply (5v), AVR-ISP PROGRAMMER, JHD_162ALCD(16x2 LCD), 100uF capacitor (connected across power supply), buttons (four pieces), 10KΩ resistor (six pieces), 100nF capacito r(four pieces), Three pin switches (2 pieces), 2N2222 transistor, Buzzer, 200Ω resistor. Software: Atmel studio 6.1, progisp or flash magic. For accurate timing, we have connected a 11.0592MHz crystal for clock. Now for disabling the internal clock of ATMEGA we have to change its LOW FUSE BITS. Remember we are not touching the high fuse bits so the JTAG communication would be still enabled. LOW USE BYTE = 0xFF or 0b11111111. In the circuit, you can observe that I have only took two control pins. This gives the flexibility of better understanding, the contrast bit and READ/WRITE are not often used so they can be shorted to ground. This puts LCD in highest contrast and read mode. We just need to control ENABLE and RS pins to send characters and data accordingly. In the circuit you can see we have used 8bit communication (D0-D7) however this is not a compulsory, we can use 4bit communication (D4-D7) but with 4 bit communication program becomes a bit complex. So as shown in the above table we are connecting 10 pins of LCD to controller in which 8 pins are data pins and 2 pins for control. Switch one is for enabling adjust feature between alarm and time. If the pin is low, we can adjust alarm time by pressing buttons. If its high buttons are for adjusting just TIME. There are FOUR buttons present here, first is for increment MINUTES in alarm or time. Second is for decrement MINUTES in alarm or time. Third is for increment HOUR in alarm or time. FOURTH is for decrement HOURS in alarm or time. The capacitors present here is for nullifying the bouncing effect of buttons. If they are removed the controller might count more than one each time the button is pressed. The resistors connected for pins are for limiting the current, when the button is pressed to pull down the pin to the ground. Whenever a button is pressed, The corresponding pin of controller gets pulled down to ground and thus the controller recognizes that certain button is pressed and corresponding action is taken. First of all, the clock we choose here is 11059200 Hz, dividing it by 1024 gives 10800. So for every second we get 10800 pulses. So we are going to start a counter with 1024 prescaler to get the counter clock as 10800 Hz. Second we are going to use the CTC (Clear Timer Counter) mode of ATMEGA. There will be a 16 bit register where we can store a value (compare value), when the counter counts up to the compare value an interrupt is set to generate. We are going to set the compare value to 10800, so basically we will have a ISR (Interrupt Service Routine on every comparison) for every second. So we are going to use this timely routine to get the clock we needed. BROWN(WGM10-WGM13): These bits are for selecting mode of operation for timer. Now since we want the CTC mode with compare value in OCR1A byte, we just have to set WGM12 to one, remaining are left as they are zero by default. RED (CS10,CS11,CS12): These three bits are for choosing the prescalar and so getting appropriate counter clock. Since we want a 1024 as prescaling, we have to set both CS12 and CS10. GREEN (OCIE1A): This bit must be set for getting an interrupt on compare match between counter value and OCR1A value(10800) which we set. OCR1A value (counter compare value), is written in above register. DDRB = 00FF;//Taking portB as output. HOU++;//if minutes of TIME =60 when button is pressed //and hours of TIME are less than 24, increment hour by one. Hello how do I get rid of the blinking cursor ? I have built the clock on a breadboard.but I am unable to burn the fuse bits in atmega32. Also can I make the clock using 1mhz frequency(default) using 64 prescaler? Please tell the fuse bits for 11.059200 MHz for atmega32. Hello,does it work one hundred percent?